The Israeli navy has intercepted two pro-Palestinian ships aiming to break Israel's blockade on the Gaza Strip and forced them to divert to an Israeli port. Two Israel navy boats full of soldiers stopped the two vessels in international waters 35 miles from the Gaza shore for two hours before forcing them to take an alternative route. An official statement from the Israeli army said that a group of its soldiers had boarded the Canadian activists' boat, named Tahrir, and the Irish one, Saoirse, and forced them to land at the Israeli port of Ashdod. “A short while ago, Israel Navy soldiers boarded the vessels which were en-route to the Gaza Strip,” the statement read, adding that the two ships were being forced to land in Israel but activists would be permitted to deliver their aid to Gaza by land. “Following their unwillingness to cooperate, and after ignoring calls to divert to the port of Ashdod, the decision was made to board the vessels and lead them there,” the statement said. During the Israeli soldiers raid on the ship, activists on board raised signs saying “boarding an unarmed ship in international waters is an act of piracy”. “The Canadian govt should be demanding protection of Canadian ship and citizens, not defending criminal Israeli policy,” the statement added. Activists on board the ships tweeted reports that the Israel navy would hand over passengers to local police and immigration authorities for interrogation when they arrived at the Israeli port. Before raiding the ships, the Israeli navy made radio contact and asked about their destination and called on them to stop or return to where they began. Despite months of political, military and alleged secret service interference, the Canadian and Irish boats had managed to leave Turkey and reach international waters. Organisers of Freedom Waves to Gaza said they had organised in secret, in a bid to prevent Israeli interference. The two vassals left port in southern Turkey on Wednesday and were expected to reach Gaza by Friday morning, organisers said. Following the Israeli interception they are expected to stay in Ashdod for a day or two and then return to Turkey. Between them the two boats are carrying 27 passengers and some US$30,000 worth of medical aid, as well as journalists and crew members, organisers said. Among the passengers is an Egyptian journalist, Lina Attallah, managing editor at Al Masry Al Youm English. Activists organised a major attempt to break Israel's blockade in May 2010, when six ships led by the Turkish Mavi Marmara tried to reach Gaza. Israeli commandos stormed the flotilla some 80 nautical miles off Gaza, in a raid which left nine Turkish activists dead and sparked a diplomatic crisis with Ankara, which recently expelled the Israeli ambassador and cut military ties with Tel Aviv. Earlier this year, a second flotilla tried to reach Gaza, but several ships were sabotaged, which activists blamed on Israel. 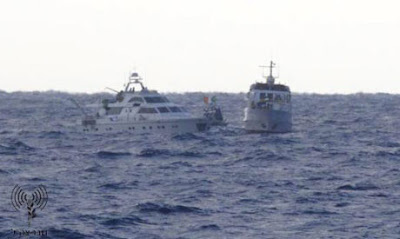 Only one ship, the Dignity, attempted the final leg before it was intercepted by the Israeli navy.